We understand that every duplication job is important to you and to your clients - that's why we strive for perfection every step of the way. As the duplication experts, we offer a full line of services, equipment and products for every need. CDROM2GO stands behind everything we do! Your satisfaction is our guarantee! CDROM2GO provides professional duplication and replication services of the highest quality. Our state-of-the-art PhotoPro printing process features vibrant, photo-realistic printing directly on CD and DVD discs. Strict quality control procedures and in-house production mean you get the best looking service orders - guaranteed. Our experienced staff can complete your duplication job in as little as 3 to 5 days from final approval. Express orders can be ready in as little as 48 hours! Replication jobs are typically completed in 7-14 days depending on the project. Count on us to complete your project before the deadline. Whether you just need a little help with your artwork, a complete disc and package design, or DVD authoring, our talented team of in-house graphic designers will work closely with you and listen to your needs. They don't just meet the standard, they ARE the standard. We are proud of our full line of disc packaging products. We carry everything from traditional DVD cases and CD jewel to more unique packaging such as cardboard mailers, VarioPacs, and paper sleeves. Be sure to check out our complete line of plastic CD cases including SLIMpak cases, TRIMpak cases, clam shell cases, C-shells, and MediaPac products. You won't find another store with more types of CD/DVD packaging in stock than CDROM2GO! All of our equipment includes toll-free technical support for as long as you own the product! When you've got questions, our technical team of experts has the answers. 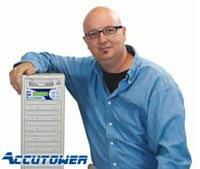 Our Accutower brand of DVD/CD duplicator towers are assembled with the highest-quality components and shipped double-boxed for added protection. In addition to the one year parts-and-service standard warranty, all Accutower and AV Pro towers include free lifetime tech support! Free ground shipping is also available on most products. From burners to printers, autoloaders to live audio, we are stocked with the latest and greatest professional gear. CDROM2GO is an authorized reseller of Primera, Tascam, TEAC, Microboards, Rimage, and other fine equipment. CDROM2GO offers FREE Ground shipping on over 150 different products! Just look for items on our site with the orange "Free Shipping Truck" icon and add them to your cart for instant savings! View our Free Shipping FAQ page for more information. Getting a price quote on a product or service is fast and painless. Don't know the difference between inkjet and thermal? Our knowledgeable sales representatives are here to assist you. Give them a call at 1-877-992-3766. Do you need a user manual for the equipment you just ordered? Look no further than our Resource Center! Want to learn more about duplication, replication, and the latest printing technologies? Be sure to visit our CD/DVD Duplication Blog for the latest news and updates from the CDROM2GO team. All of these complimentary extras and much more are available on our website, without need for registration, twenty-four hours a day, seven days a week. It's all part of our commitment to you, the customer.